An artist has "vandalised" Snapchat's newest feature in protest against an "augmented reality corporate invasion". Snapchat recently teamed up with artist Jeff Koons to make 3D replicas of his artwork visible with its smartphone app in nine major cities. 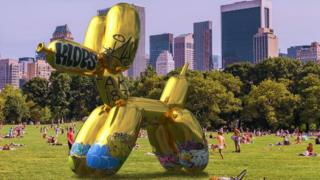 Sebastian Errazuriz protested by making a graffiti-covered replica of Koons' Balloon Dog sculpture in Central Park. An academic said the protest draws attention to "important questions" about cities' digital spaces. Snapchat's artworks are part of its 3D World Lenses offerings, which add augmented reality filters to real-world scenes when using its app. Mr Errazuriz said that while Snapchat's virtual installations seem "relatively innocent", they also represent a "technological and social milestone". "The growth of augmented reality... will soon see corporations increasingly encroaching on public space. "It is vital to open up a dialogue and start questioning now how much of our virtual public space we are willing to give to companies." Image caption "Central Park belongs to the city of NY," Mr Errazuriz wrote on Instagram. "Why should corporations get to geo-tag its [GPS] co-ordinates for free?" Mr Errazuriz said he and his team at studio Cross Lab initially submitted their protest sculpture to Snapchat. When they received no response, they created an independent app called ARNYC, which allows users to see both the original Snapchat sculpture and the graffiti-covered version in the same location. ARNYC's website says that the app is still being reviewed. Mark Graham, professor at the Oxford Internet Institute, said "we should be asking questions" about who controls a city's virtual space. "I don't think that there is anything particularly problematic with Snapchat's decision to display virtual installations around the world," he told the BBC. "The issue is more just that, as ever more people experience their cities through a digital lens, everyone should feel they have a right to access, use, and create in those digital spaces." "I think Mr Errazuriz's protest is effective in the sense that it draws attention to important questions about control, access, and visibility of the digital layers of our cities." Snapchat's Balloon Dog is also visible in Hyde Park in the UK. Snapchat has not yet responded to requests for comment.